In this study, conducted approximately 1 year after Hurricane Katrina made landfall, almost 1 in 4 hemodialysis patients had PTSD. Many subpopulations, including blacks and patients more recently initiating treatment for ESRD, were more likely to have PTSD symptoms. Additionally, hemodialysis patient evacuation experiences were associated with having PTSD. This finding indicates the need for improved preparation and emergency plans for hemodialysis patients. 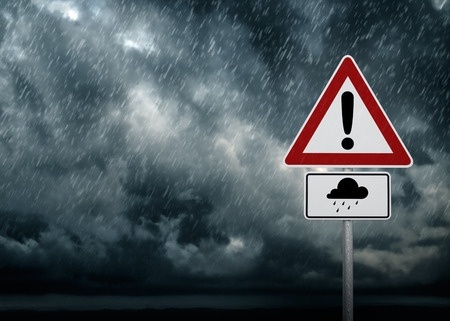 Staff at dialysis facilities need to be aware of the high PTSD symptom burden and coordinate interventions for patients who have PTSD after future disasters. Figure 2 from Hyre et al, AJKD © National Kidney Foundation. Prevalence of post-traumatic stress disorder (PTSD), partial PTSD, and PTSD symptom criteria in hemodialysis patients approximately 1 year after Hurricane Katrina. PTSD was defined as the presence of 3 symptom criteria, including intrusion/re-experiencing, avoidance/numbing, and hyperarousal; partial PTSD was defined as the presence of 2 symptom criteria. Figure 1 from Lempert and Kopp, AJKD © National Kidney Foundation. 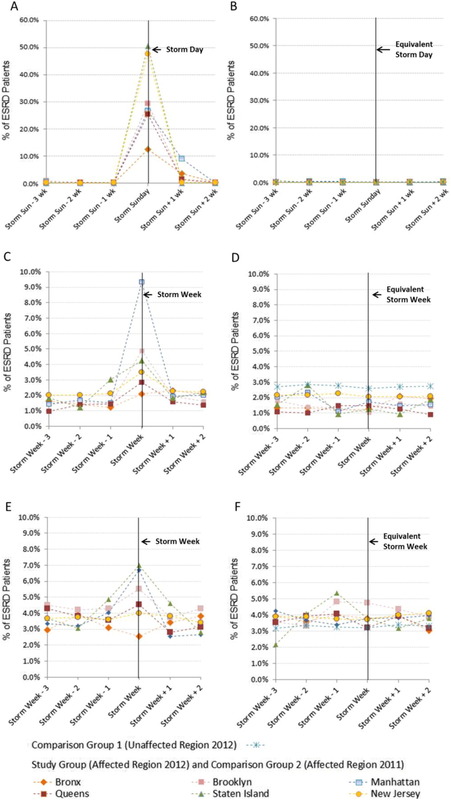 Kelman et al used claims data from the Centers for Medicare & Medicaid Services (CMS) Datalink Project to characterize patterns of care and mortality of patients with ESRD who live and receive dialysis in the areas that were most affected by Sandy. Understanding how patients with ESRD receive care during disasters is critical to informing preparedness actions and mitigating adverse outcomes for this vulnerable population. 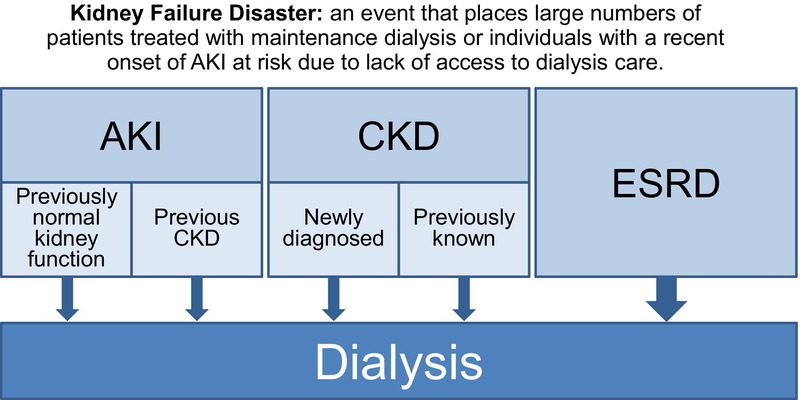 Figure 1 from Kelman et al, AJKD © National Kidney Foundation. Services and outcomes of study and comparison group patients. (A) Study group: early dialysis on Sunday by borough, state; (B) comparison groups 1 and 2: early dialysis on Sunday by borough, state; (C) study group: emergency department visits by borough, state; (D) comparison groups 1 and 2: emergency department visits by borough, state; (E) study group: hospitalization by borough, state; and (F) comparison groups 1 and 2: hospitalization by borough, state. Abbreviation: ESRD, end-stage renal disese. 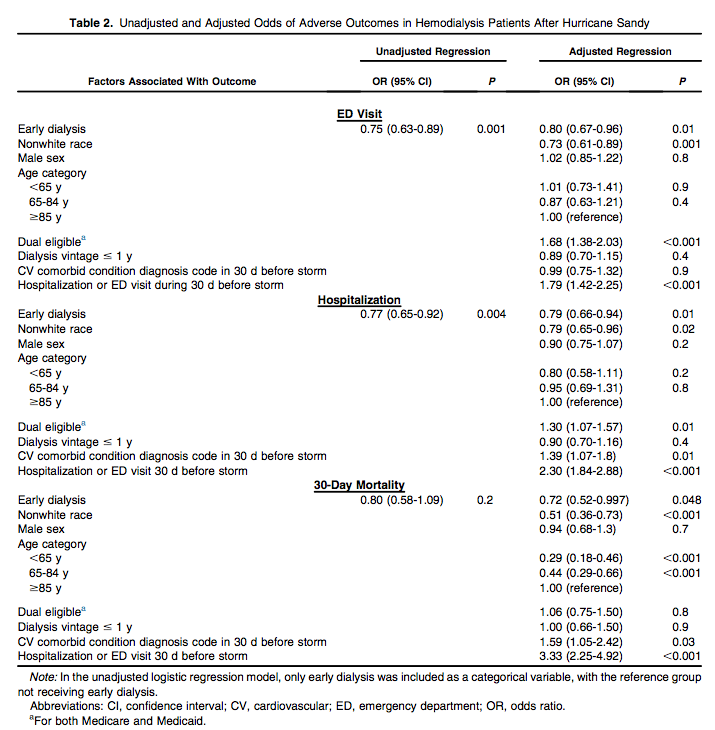 This study confirms that early dialysis ahead of Hurricane Sandy’s landfall decreased the likelihood of ED visits, hospitalizations, and 30-day mortality for dialysis patients in the areas most affected. Such evidence affirms the importance of preparedness practices on the part of dialysis facilities to provide early dialysis, as well as the need for dialysis patients to receive early dialysis when access to routine dialysis may be threatened. Lurie et al, AJKD © National Kidney Foundation. 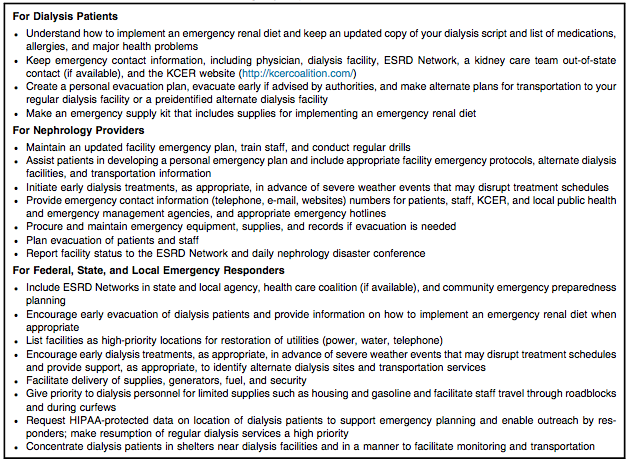 Katrina exposed numerous gaps in emergency preparedness for dialysis patients, facilities, and providers. Patients receiving dialysis did not know how to adequately prepare for the storm, many hospitals and dialysis centers had insufficient disaster plans, and public health and emergency management agencies did not know how many people in their community were dialysis dependent and likely to need assistance in the wake of the storm. In the 10 years since Katrina, the United States has made significant progress in emergency preparedness for dialysis patients. In this editorial, Dent et al review key elements of progress and discuss what can be done to address the remaining gaps. Emergency Preparedness Recommendations. Box 1 from Dent et al, AJKD © National Kidney Foundation. 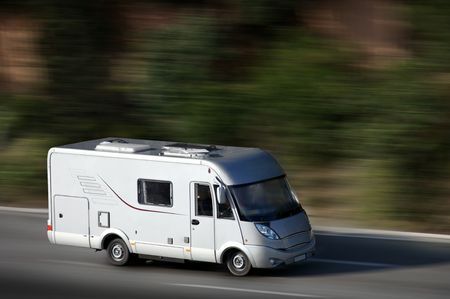 In this In A Few Words essay, Dr Ullian relates the story of a patient who set up peritoneal dialysis in his RV instead of his home. One of the reasons? Since Charleston is susceptible to hurricanes, evacuation with his life-sustaining PD supplies and equipment would be much easier if they were already in the RV. The Emergency Access Initiative (EAI) provides temporary free access to full text articles from major health and medicine journals, including AJKD, to healthcare professionals, librarians, and the public affected by Hurricanes Irma, Harvey, and Maria, as well as the earthquakes in Mexico, until November 10, 2017.